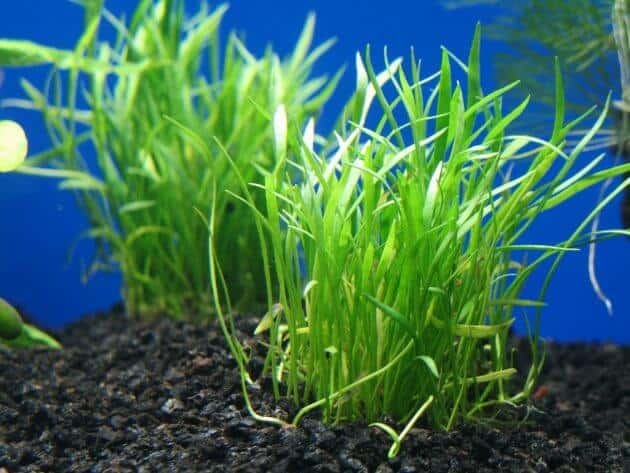 Grass For Freshwater Aquarium Lilaeopsis Brasiliensis or Called Micro Sword – Lilaeopsis brasiliensis or known as Micro Sword is one of freshwater aquarium grass plants. 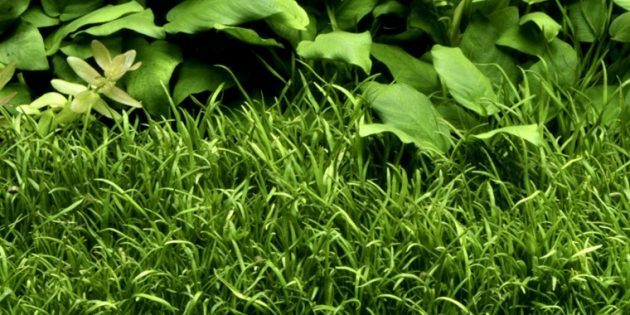 In aquaria market, this aquarium grass also sold under the name Micro Sword Grass, Copragrass, Carpet Grass or Brazilian Micro Sword. They are an ideal ground cover plant for tanks which creates an impressive lawn in the aquariums. This foreground plant was first described by Glazion in 1990 under the name Crantzia brasiliensis, but in 1985, J.M. Affolter changed that plant into Lilaeopsis brasiliensis. The American botanist Edward Lee Greene is the man has erected the genus of ‘Lilaeopsis,’ and the name means ‘charming the eye’, as well as the species name, comes from its native habitat Brazil. It also can found in Argentina and Paraguay where mostly life on wetland, swamps, lakes, rivers, floodplains, streams and banks of ditches. 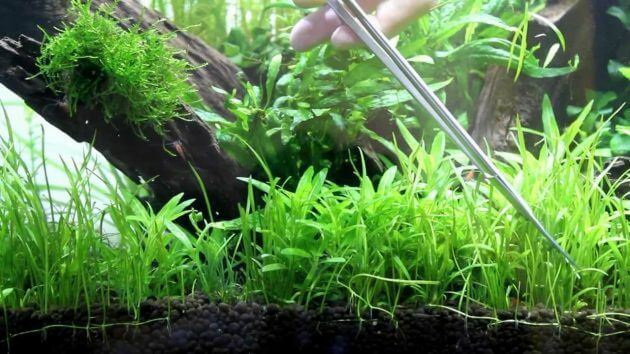 Brazilian Micro Sword is aquarium carpet plant that grows maximum is 10-18 centimeters or 4-7 inches in the aquarium with high light intensity, a good quality substrate, injection CO2 and adding regular liquid fertilizer with micronutrients. The Copragrass has leaf blade forms can be linear or less with apex sharp or rounded and tapering base. Micro Sword Grass is one of a short-stemmed plant with bright green grass-like leaves where shape a short carpet in the right conditions. This freshwater tank plant it’s suitable for beginner and expert aquascapers. It is a beautiful foreground covering plant that makes a great environment for spawning fish and shrimp to lay their eggs. Besides, it’s also become a hiding place for baby shrimp. 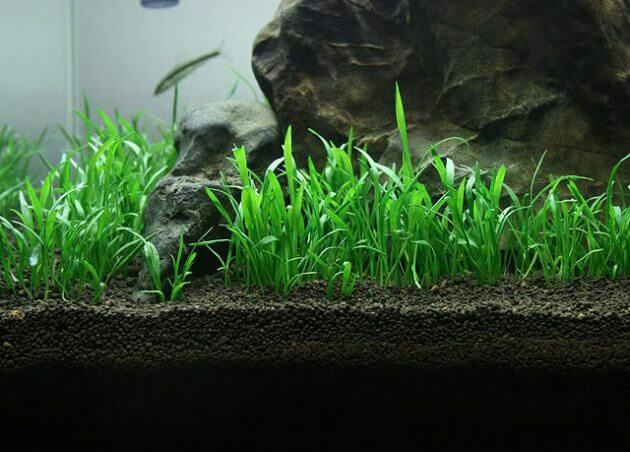 The Carpet Grass is the perfect plant for a small tank, large tank or bowl. They can help keeping with most species of community fish, but any big herbivorous and lager digging cichlids fishes should be avoided. The most pleco species can co-exist with them. When buying Lilaeopsis brasiliensis its should have vibrant green leaves and good to look as well as healthy. The leaves are at least about 2 inches long. Avoid plants with cracked, yellowish leaves, have lots of dead tips, torn and have visible amounts of algae. The Brazilian Micro Sword is frequently sold in a pot. It’s difficult to see the root plants in the aquarium store. But commonly, if the leaves look healthy, then it’s a highly safe bet that are in good conditions too. They also sold in mat form in an aquarium store, such as a swatch of fabric which in this case, the roots plants is easier to look. Lilaeopsis brasiliensis is moderate to difficult to keep in the tank, mainly when keeping in low tech aquariums with low light. For the optimum growth, the tank should have a good substrate with rich micronutrients, regularly adding liquid fertilizers which it’s should have nitrate, phosphates and other micro-nutrients. Besides it, adding CO2 injection and sufficient light intensity will give great benefits to the plants. Brazilian Micro Sword is a hardy aquarium plant which it can grow almost in all conditions. But for the maximum growth levels, light intensity should be two-three watts/gallon and use full spectrum (5000-7000K) bulbs. Occasionally, the algae buildup is likely to occur on the plants that make it unhealthy and brown. To fight algae buildup in your aquarium some Amano shrimp or Red Cherry Shrimp should be kept to remove the algae, or you can use Flourish Seachem Excel to remove them. 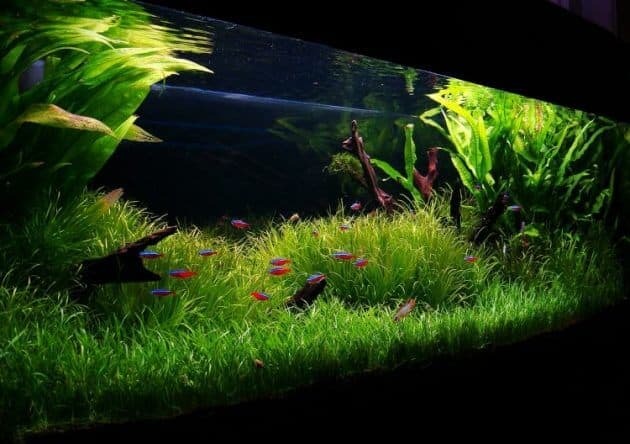 And to keep your tank stay looks beautiful, trimming the plants it should be done because it’s growing fast, particularly in setups with high lighting. Lilaeopsis brasiliensis can cultivate easily under tank condition with proper care. By cutting off the runners from the mother plants use sharp scissors. 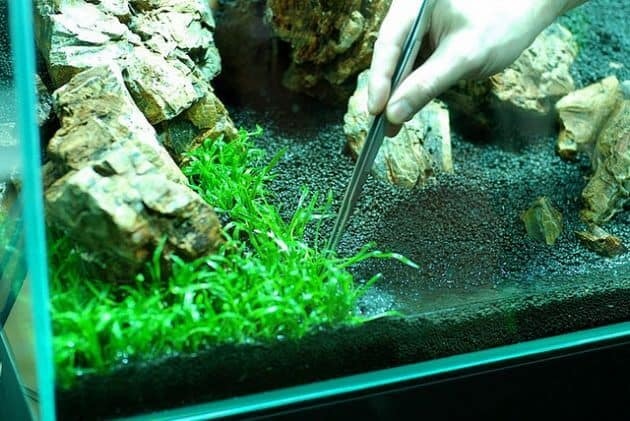 During the cultivation, the aquarium should have an ideal substrate with some sand or soil or gravels. To get the great results using ADA Aqua Soil Amazonia is the best choice because it has good granules which the roots can grip strongly and has many micronutrients whose needed by Lilaeopsis brasiliensis. Planting this plant should be done to a depth of two or three millimeters with using tweezers. Next step, after cutting off the runners, small bunches of the runners should be entered into the substrate in a checkboard pattern at the interval of a few centimeters to help this plants grow quickly. If they planted correctly, these little runners would take the roots very faster and formed a new plant. In a few months, the baby plants grew in and shaped a dense carpet on the substrate. Don’t forget, before planting the bunches of runners must be flooded for about 4 minutes in bleach solution or potassium permanganate solution to prevent the algae growth on them. Did you know if Amazon.com currently extra discounts and free shipping to purchasing Lilaeospisi Brasiliensis (Micro Sword)? Click here to check out the offer.